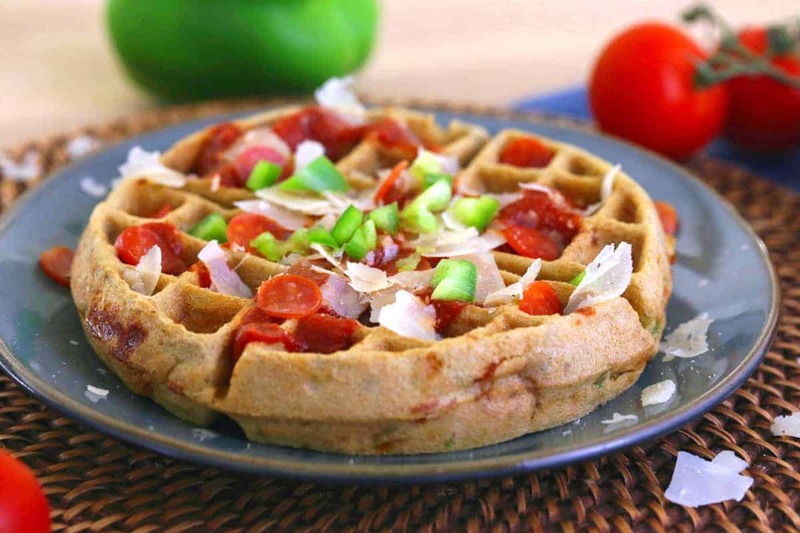 Healthy Savory Waffles for Breakfast or Dinner: PIZZA Waffles Recipe! I love a warm, fluffy Belgian waffle doused in maple syrup. But, who says waffles have to be sweet? For a fun flavor twist, try some deliciously SAVORY waffles instead—like this pizza waffles recipe! Comforting, cheesy, and with 16g of protein each, they’re tasty AND healthy enough to enjoy for breakfast, lunch, or even as dinner waffles. With a bit of Italian seasoning in the batter, plus some pizza-tastic mix-ins like mozzarella, pepperoni, and chopped bell pepper, you get the full pizza experience in every bite. And, these are also gluten free waffles since they’re made with brown rice flour instead of all-purpose or wheat flour! To be clear, these pizza waffles don’t just taste like you popped a pizza in a waffle maker and tried to cook it. On the surface, they’ve still got the shape and texture of irresistibly fluffy Belgian waffles. But, take a bite, and you’ll taste the deliciously meaty, cheesy pizza baked inside! 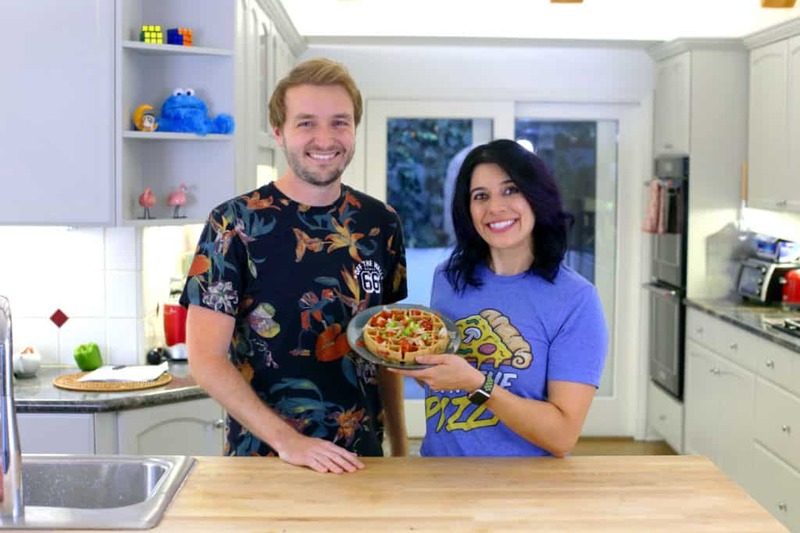 I definitely recommend topping your cooked pizza waffles with extra cheese, pepperoni, and more veggies—or whichever savory waffle toppings you’d like. Then, finish ’em off with some warm pizza sauce as a savory alternative to maple syrup! Believe it or not, it’s actually pretty easy to make healthy waffles. If you’ve ever made healthy pancakes or breakfast cookies, you know this is true! It’s all about choosing wholesome, fuel-filled ingredients to substitute for the not-so-healthy ingredients used to make the classic treats. For these pizza waffles, you can really adjust the ingredients to lighten up the recipe however suits your lifestyle. You can cut down on or omit the cheese and/or pepperoni if you like, or pack in more veggies like finely chopped broccoli or mushrooms. 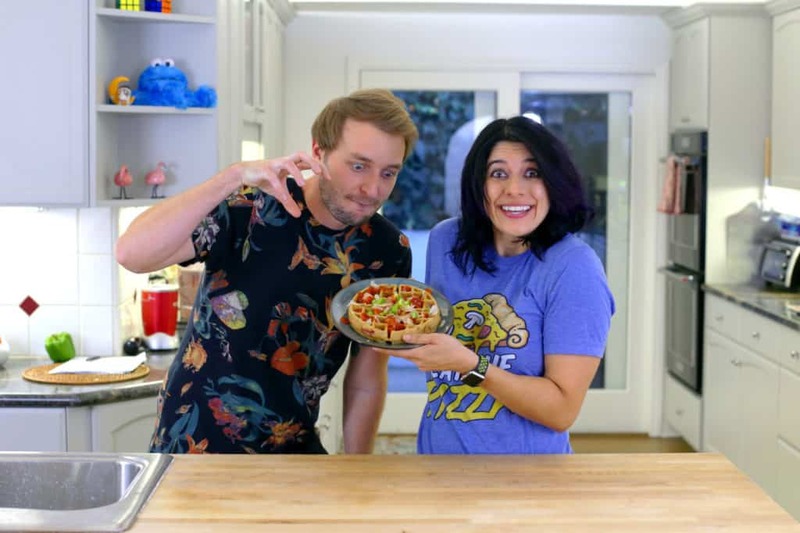 But, despite the idea that ‘pizza’ is ‘bad,’ these pizza waffles are pretty darn wholesome as-is! One waffle can satisfy for an entire meal, with around 400 calories, 16g of protein, and 19g of wholesome fats to keep you fueled and satisfied. 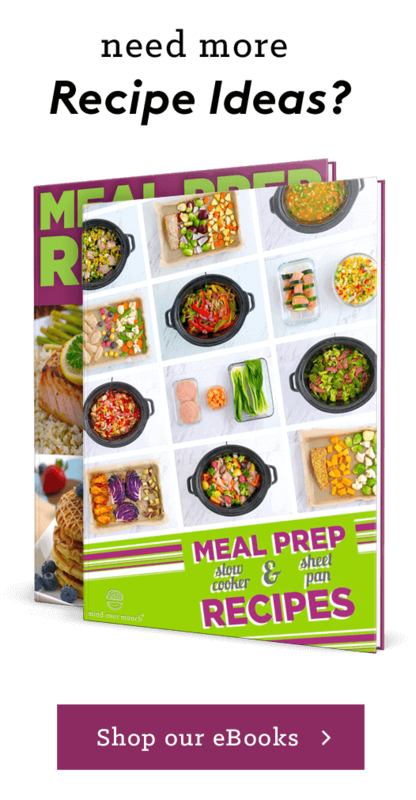 Plus, each contains 44g of slow-digesting complex carbs and 3g of dietary fiber, so these savory waffles won’t send your blood sugar skyrocketing. In part, that’s thanks to the fact that you don’t have to douse savory waffles in maple syrup! And, most importantly, the main ingredient in these gluten free pizza waffles is a whole grain. These hearty brown rice waffles are fluffy and perfectly crisp like classic waffles, yet satisfying enough to fill me up. Because they’re more fuel-filled, made with a nutritious whole grain flour instead of refined flour! Yes, these are gluten free waffles. But, more than that, it’s the whole grains that makes them a healthier choice. Traditionally, waffle recipes feature refined all-purpose or wheat flours because they’re the lightest and easiest to work with. Gluten gives those flours a nice and stretchy quality, which helps the final product to fluff up more. But, the refining process also strips those flours of the nutrients that the original whole grains contained. 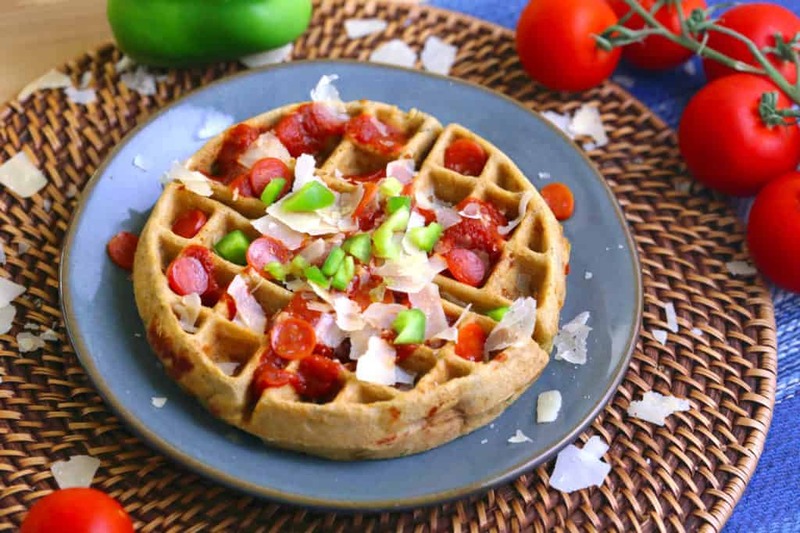 Instead, these pizza waffles feature brown rice flour, which is a whole grain flour. It still contains all of the nutritious fiber and micronutrients as brown rice, since the entire grains are ground while still intact! That’s how brown rice flour is actually the major source of fiber, protein, and even iron in each of these pizza waffles. Plus, since brown rice flour naturally contains no gluten, it’s an all-star base for making gluten free waffles! Rather than relying on a refined gluten free flour option, you can make truly healthy waffles with whole grain nutrients—and still nix the pesky gluten. 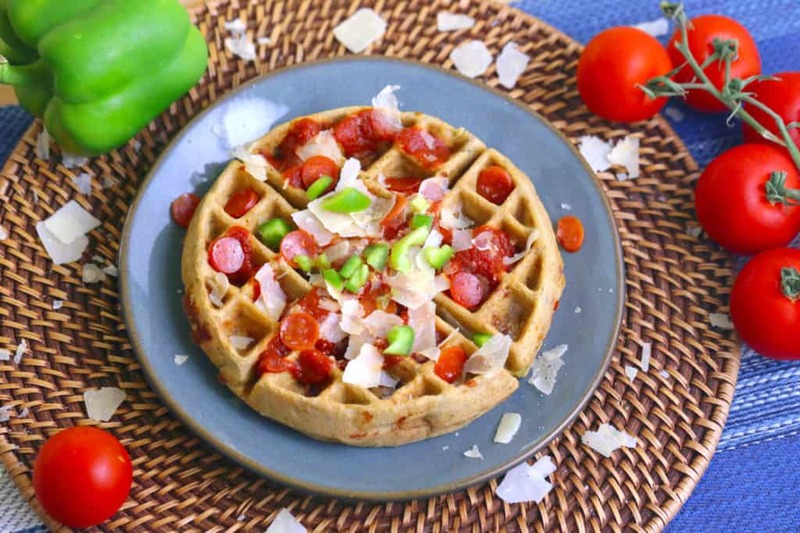 Whether you’ve got a hankering for savory waffles or are craving a more nutritious alternative to pizza, these pizza waffles are worth giving a whirl! 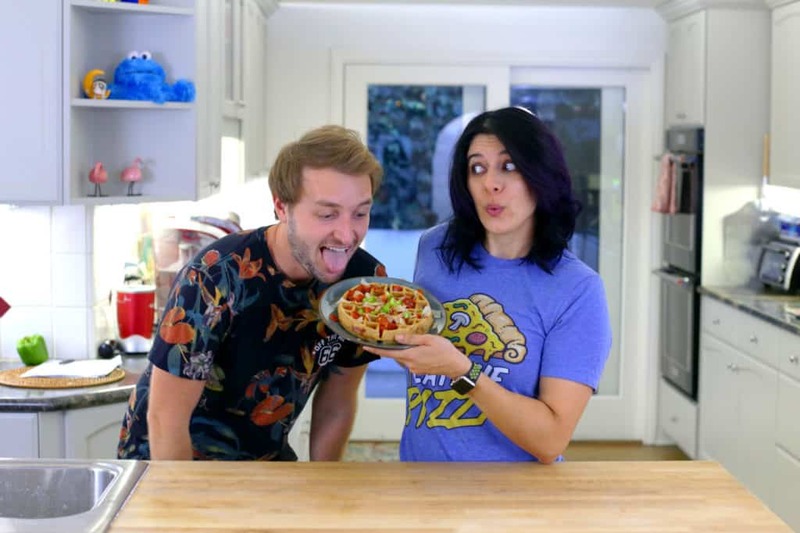 If you enjoyed this pizza waffles recipe and want more like it, come on over and subscribe to our 2nd YouTube channel, Eat The Pizza! We’re into all things pizza and pizza-flavored things, and we’ve got TONS of crazy recipes crafted for true Pizza Freaks. 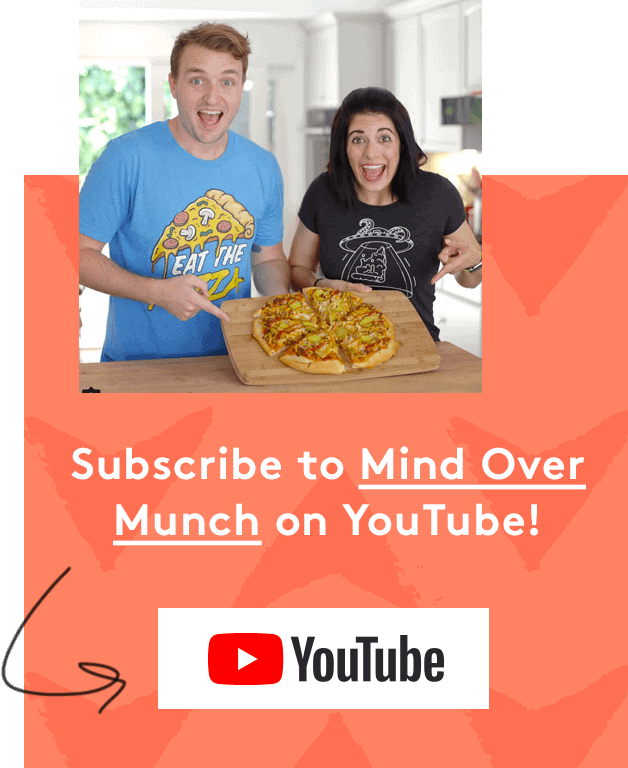 or any pizza mix-ins that you enjoy! In a large mixing bowl, whisk eggs until frothy. Stir in milk, coconut oil, and salt, whisking well to combine. Add in flour, Italian seasoning, and baking soda, whisking until there aren’t any lumps left. After batter rests, stir in pizza mix-ins. Serve topped with warm pizza sauce and parmesan and enjoy! Yields ~3 pizza waffles, using a round, 7-inch diameter Belgian waffle iron. Vegan Breakfast Cookies 3 Ways—Paleo, Gluten Free & No Bake!